As a follow up to yesterday’s post regarding Steve Vander Ark’s testimony in the case of J.K. Rowling and Warner Brothers vs. RDR Books, we have the following details. Please note that Leaky was in attendance, and as on Monday, all notes were handwritten as recorders were banned. During questioning, it was established that SVA does not have a degree in Library Science, and that he was asked for his resignation from his job as a librarian in October. He contacted the Christopher Little Literary Agency in May of 2007 and again in July via e-mail. SVA told RDR that he was concerned about copyright issues with a print version of the Lexicon. Roger Rapoport of RDR Books used to work at Ulysses, which published the MuggleNet book. When asked if he and RDR had had a conversation about the potential Lexicon book making as much money as the MuggleNet book, he responded: “I don’t remember a conversation like that….I only knew it was on the New York Times bestseller list.” He also said he “only brought up as a joke” the possibility of the book making the New York Tmes bestseller list. 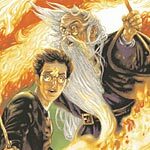 It was noted the Lexicon book would be rushed to stores for two reasons: because of the publication of the MuggleNet book, and because of the Christmas season. WB asked if as a media specialist, one of his areas of expertise was copyright. WB asked if he had read a lot of books about copyright or attended conferences on copyright. SVA responded: “I don’t think I’ve read a lot of books copyright. I’ve attended conference as relates to children using copyright…” The judge asked for clarification on this statement, and SVA explained that part of his job was to instruct children on what is allowed and what isn’t. The defense objected to the line of questioning, stating that there was no clam of infringement in the use of electronic copies in the filings. The judge overruled the objection, but said he’d take the note into consideration. When asked to confirm that he had written the post, SVA responded: “I don’t have that document in front of me but I’m not disputing it.” He went on to explain that the comments were in references to the short-lived Newton electronic device and the small resultant community’s desire to share what they had relating to it and the legality of that. Regarding an entry about Goblins imbibing metal, SVA said the words used were said by a character (“According to Phineas Nigellus, goblin-made armour does not require cleaning, because goblins’ silver repels mundane dirt, imbibing only that which strengthens it”), “So yes, we had to use those words.” He was asked why he didn’t use quotes around the portion of text that came from the character’s mouth. “That not the form of the sentence,” he responded. WB asked SVA to describe “clankers”. The David Colbert book was again referenced as “another HP encyclopedia,” and SVA said, “I wouldn’t call this an encyclopedia. There are similarities between the two but it doesn’t aim to be exhaustive or complete. Mr. Colbert’s purpose is to talk about other things than the Harry Potter books,” while the purpose of the Lexicon book is to be a “ready reference” so that people can look things up quickly. WB asked him to confirm that he had not talked to anyone about using that information in a book. SVA mentioned whom he had spoken to about the website permissions [the name of person is unclear]. WB then asked if in 2002, when he got that permission, if it could have been for anything but the Lexicon website. SVA said no. Regarding other books referenced in the Lexicon, the portion of the book that says all information came from JKR was highlighted. WB asked if it was true that he only sourced a specific outside reference four times. WB asked if about one percent of entries contained etymology. SVA responded that if she had counted up he’d be happy to agree. When asked about fan contributions to the site, SVA said it would be “difficult for me to show where” other fans had contributed information to the eventual HPL manuscript. WB asked if he ever advised fans that their work might be included in a for-profit book; this question was objected to and sustained. WB referenced the exhibit in which SVA said he had “sicced” his lawyer onto someone for copying the Lexicon; SVA said that was an instance in which someone had taken pages from the Lexicon and JKR‘s site and was selling them on the Web site. He said he wrote to the CLLA at the time to tell them. A video in which SVA said that “Jo has quit, she’s done, we’re taking over now” to a room full of fans was played. The judge asked “Is that the whole clip?” and WB said yes; SVA interrupted that it was a small portion of what was available at YouTube. He was asked if he told fans to disregard the Epilogue from DH and said he’d like to explain the greater context of his comments to that effect (but did not). SVA said that he not only hadn’t seen the testimonies from the day before, but hadn’t read any articles and didn’t know anything about what Jo said on the stand. In the remainder of this proceeding an e-mail of mine was brought into question; therefore, for many reasons, I will recuse myself and longer post news about this case. Kristin will do so from now on. She has been provided raw transcription notes from the this testimony in order to give it equal time as JKR‘s had; this is only the examination, and not cross-examination, as I stopped taking notes as soon as the e-mail was brought in. The rest of the information will be culled from other sources and posted here; thanks, everyone!